The Crystal Bowl Harmonic Activations are a deep-breathing sigh into the depth of your body wisdom. The acoustic sounds of these unique Crystal instruments open spaces that create glowing serenity and ease deep within the body, mind and spirit. The quartz crystals in every bowl are able to amplify, store, focus, transfer and most important transmute energy. Our bodies are also crystalline in structure. 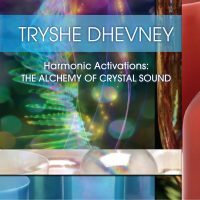 As you receive these soothing tones and overtones you will have entered into the world of crystal sound therapy, the healing effects of which are palpable. Each bowl used in these activations is a Crystal Tones™ high frequency gemstone, mineral and metal infused Alchemy Crystal Singing Bowl. *Note: Though head phones are not necessary to receive these frequencies, using head phones will intensify your experience of the sound. *Note: If you are so inspired, please tone along with the activations as the sound of your voice will amplify the effects of these good vibrations.